This rig is ideal for introducing the concepts of underfloor heating and to the language and terms that are used commonly when discussing, installing and designing UFH systems. The layout of the rig allows physical examination of a range of heated floor construction, and it can be used to demonstrate how UFH systems work and how they are controlled. It can also be used to show and explain why some forms of UFH are ideal for use with sources of renewable energy, and why some are completely unsuitable. Situated at the front end of the rig is a complete working manifold assembly. This enables the trainer to explain how pipe circuits are created within the structure of a floor and show how a room thermostat can control the flow of warm water into each heating circuit. It demonstrates how a demand from a room thermostat can open the appropriate control valve(s) and activate the boiler/heat pump. It also shows the gradual opening of control valves and how the pump and water mixing valve function, and should be adjusted. The rig incorporates two different types of room thermostat. 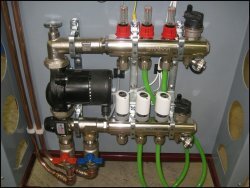 One is wired to control a single actuator and the other is wired to show how a single room thermostat can control two actuators and consequently two pipe circuits. Teaching Notes: Each rig is supplied with a set of progressive step-by-step teaching notes and diagrams. These include basic explanatory notes about how UFH works by comparison with radiator heating, the floor temperatures involved and describe how the training rig should be used to illustrate the training. The rig is intended to provide any student who wishes to go on to learn more about UFH and how UFH systems should be installed, commissioned or designed, with sufficient understanding to be able to benefit from subsequent classroom studies which can lead to NVQ Level 1 or Level 2 qualifications, or simply to become a knowledgeable installation-trainee.